Thailand provides a unique and relaxing choice as a honeymoon destination. To help with your planning, check out this 12-day itinerary for Phuket and Krabi's Railay Beach as your island/beach destinations. By visiting these two locations, you'll get a chance to experience one of the country’s most popular islands, with all its conveniences, restaurants, shopping, and crowds, plus a more remote, rugged beach that’s quieter and more beautiful. You could just as easily substitute ​Koh Samui and Koh Tao. In fact, there are ​fantastic honeymoon spots all over Thailand. This itinerary has you moving around a little. You’ll visit three places in just under two weeks, and you’ll be relying on airplanes, cars, and boats to get around. If you do a trip like this one, make sure to pack light—it’s no fun to try to lug a 40-pound suitcase into a small wooden boat. Almost all resorts and hotels in Thailand have laundry service so you don’t need to bring a ton of clothing. On this day, arrive in Phuket by air. Splurge on your resort’s airport transfer so you know someone will be waiting for you when you land. Check into your hotel, and spend the first day adjusting to the new time zone but make sure to ask your hotel to arrange a day trip to Koh Phi Phi so you can snorkel in the Andaman. If you’re a diver, you may want to arrange a more specialized itinerary. Have dinner at your hotel or somewhere very close (no need to have a super-special dinner tonight; you’ll probably be too tired to enjoy it). On day two, head for the beach! If you’re staying in Patong, you’re in for crowds, jet skis, and lots of people watching. If you’ve picked a quieter beach, such as Surin, enjoy the relative calm. Whatever beach you choose on Phuket, you’ll likely have lots of options for a casual lunch. In the afternoon, head back to your resort for some time by the pool. In the evening, consider heading to Patong (if you’re not already staying there) for a local seafood meal and to experience a bit of the island’s nightlife scene. 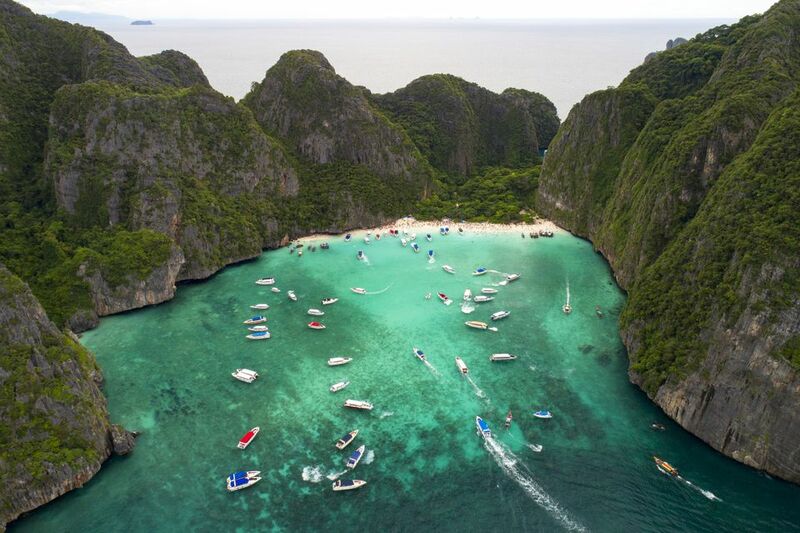 Wake up early, and head to the pier to board a boat for your day trip to Koh Phi Phi. Remember that nearly all tour guides will pick you up from your hotel, so you don’t need to worry about getting anywhere but down to the lobby. One thing you should worry about, though, is sunscreen and a hat, as you’ll be out on the open water for hours! Spend the day island hopping as you travel by ferry or speedboat from island to island, snorkeling, and sightseeing. These trips generally include lunch and, once the trip is over, a ride back to your hotel. Refresh and relax before heading out for a special dinner in Phuket. After a relaxing breakfast at your resort (nearly all include breakfast so there’s no reason to travel anywhere for your morning meal), if you’re interested, arrange a car or taxi to take you to old Phuket Town in the late morning. Explore the area for an hour or two (it probably won’t hold your interest for longer than that), then head to lunch at one of the city’s new crop of cool and interesting restaurants. Afterword hit the coast for an afternoon swim. For dinner, consider roughing it a bit at one of the many local restaurants serving casual Thai food in Phuket. Otherwise, head to one of the island’s fancier spots for dinner. Spend the next two days totally relaxing on the beach or by your resort’s pool. If you want to get a little shopping in, head to Patong’s Jungceylon Mall. If you time it right, you can also have lunch or dinner there, as there are lots of moderate to high-end restaurants to choose from. Wake up early and either ​rent a car or arrange a driver to take you to Krabi. Though it would seem to make more sense to go by boat, there are no direct ferries from Phuket to Krabi, and the drive is only a few hours. When you get to Ao Nang, hop on a longtail boat for the 15-minute ride to Railay Beach. At Railay Beach, check into your hotel, relax, and have lunch on the beach. Railay is a small area, so you’ll be able to get the lay of the land quickly. Spend the next couple of days relaxing on Railay Beach, but make sure to take at least a few hours to try some rock climbing (there are instructors who can teach you and will keep it easy and safe), and some ocean kayaking, as there are little islands and beaches to explore that are best reached by kayak. Wake up, pack up, and head off Railay Beach to the Krabi airport, where you’ll catch a flight to Bangkok. Most honeymooners spend a couple of days in the capital before or after some time on the islands. You can use this Bangkok honeymoon itinerary to plan that part of your honeymoon. What Are the Best Beaches in Thailand?